Much has been written about the Nant Rhyd Wilym Pass (Over the Top) in the Berwyn mountains of North Wales, but this piece is to demonstrate Charlie Chadwick’s part in its acquiring the monument stone at the summit in honour of Wayfarer, (Walter McGregor Robinson 1877-1956). Walter was a resident of Liverpool and wrote frequently in the Cycling magazine about his cycling exploits, often on the lonely tracks to be found in the North, and his demise in the founding year or so of the Rough Stuff Fellowship certainly brought forward a desire by the RSF membership to record his passing. 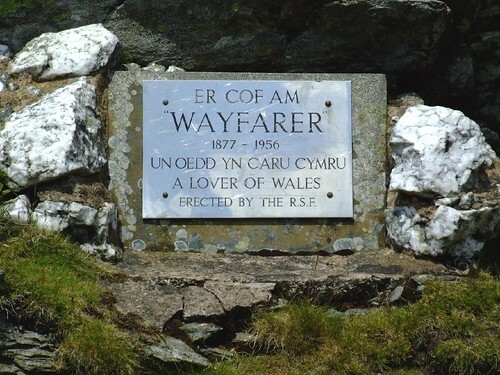 Having chosen Wayfarer’s favourite route on which to place a memorial stone, it was just a matter of organisation. Charlie had much input here, along with a gentleman called Vic Ginger, another founder member of the RSF, and we mustn’t forget the work done by Bob Harrison and Gerry Swift from the Wigan area. Planting a memorial stone on the summit of a mountain crossing is something that needs permission, step forward Vic Ginger, who lived in Wrexham and had the gift of the Welsh language. His frequent reports to Charlie Chadwick (as Chairman) in the spring of 1957 of progress with the project have never before been published and I don’t believe they should go unpublished because of the humour and enthusiasm of Vic, which comes through in spades. So I am reproducing the original Vic Ginger letters to Charlie Chadwick for all to read. It is worth mentioning as someone who knew Vic Ginger that he was a very much larger than life character, eccentric almost, and who started life as a cyclist as a member of the Buckshee Wheelers, a British Army cycling club formed from serving soldiers in the Middle East shortly after the end of the last war, when we had garrisons aplenty in Egypt, Palestine and North Africa. (Bert Williams, the RSF first Journal editor also joined the Buckshee Wheelers and raced in the North African desert as well). As Chairman of the RSF Charlie was in charge of the ‘Over the Top’ project but actually left little written material about the project, but this flow of never before seen letters recording Vic Ginger’s progress reports to Charlie make fascinating reading, and demonstrate all you need to know about planting monuments in the country. Six scanned letters from Vic Ginger dated 13 April 1957 to 21 May 1957. We now have Charlie’s version of the weekend of the stone planting ceremony, except that the final day is missing from his report, but worth reproducing I feel given that we have come so far. It is in the form of a report to Bert Williams, the Journal Editor at the time. Final words about the laying of Wayfarer’s Stone. As you know we had the use of a large hut wedged into the upper end of Nant Rhyd Wilym at a height of 1,700 ft, that is three quarters of a mile and about 200 ft below the actual summit, Vic Ginger could get his car so far, so he promised to have lashings of tea awaiting us. Chippings and sand had already been dumped on the top of the pass, and the cement was in the boot of the car. This long suffering ‘boot’ also carried a two wheeled truck specially made for rough ground, trenching spade, hammer, chisel, in fact everything except a grand piano. He also had a five gallon oil drum full of water, an oven, a large petrol and two small primus stoves, camp chairs, table, a lovely pneumatic tent and a camp bed. Vic was doing things in the grand manner. I had travelled alone, by train to Chester, lunch at Chirk, and at 3pm was well along the Swch Cae Rhiw lane from Llanarmon DC. A car came along carrying Emrys Williams and his daughter from Llangollen. At the end of the tarred section Emrys parked his car, and we walked up the old road together. It was a lovely, hot day. On the latter stages we wondered how Vic got his car past the boggy deeply rutted parts, but he had – there was old Vic, tea ‘on the hob’. That was a quarter to four. At 4pm Bob Harrison arrived from the other side, following him were Terry and Jim Shipperbottom. We had a snack tea. Although Bob’s party had come over the pass, and had seen the sacks of chippings and sand, and a spade etc, they had seen no stone. At 5pm the seven of us loaded the truck with cement and implements and sweated our way over the rough ground to the summit. This was a glorious spot, though the views were spoiled by a heat haze. No stone, so Terry and I went down the north side for about 300 ft to a sheep pen and searched around. No Stone. It was obvious that the stone was still at Mr Parry’s house at Cynwyd. Just then Arthur Matthews from Southport appeared on the horizon, minus shirt and vest, and riding in his underpants. I commandeered his bike and sent Terry down to find the farm. Arthur, (now dressed), and I rejoined the party. A perfect site was found under the bulge of a rocky outcrop. We set to work, four of us digging down to bedrock or breaking stones, and Arthur and Vic returning to the hut to prepare tea for further arrivals. Emrys and his daughter Pat returned also. At 8pm we retired for a tea-break, and just as we were about to start back Terry arrived with a success story. He had found the farm, but the family were away at Glynceiriog Eisteddfod. He persuaded a farm hand to get a tractor out, and the stone and Terry’s bike were put aboard, and taken on the hectic ride to the top. From the bedrock we put in broken stones, packed solid with cement, then a bed of chippings. The air became bitterly cold as the sun went down, and we were glad to complete our foundations, even and correctly levelled. All our water had to be carried about a quarter of a mile. We returned to the hut in high spirits. Vic had tea on, and the hardest words were wisecracks. At 11pm we turned in, Vic and I in the ‘Igloo’ tent, and the six chaps on the hard floor and the forms of the hut. The night turned very cold, and those who slept at all slept fitfully, but at 7am when we…..
and that, I regret to say is all we have of Charlie’s report. What you have here of course, is Charlie Chadwick in a different era from his writings which are dated 30 years earlier and before marriage and home making and suchlike concerns which arise as one ages.